Do you know you can find the profile of Sudan, the world's only male northern white rhinoceros on Tinder? Tinder is a smartphone app people use to find a date. Sudan's profile says "the fate of the species depends on me," and he enjoys travel and the outdoors. Since rhinos cannot use smartphones, who wrote the profile? Sudan lives in a wildlife conservancy in Kenya called Ol Pejeta. The conservancy created the profile to draw attention to the endangered species. There are only three northern white rhinos alive. Many were killed by poachers who took their horns to sell. In some cultures, the horns are used as special medicine. That is why they can be worth up to $50,000 per kilogram. The two female northern white rhinos are named Fatu and Najin. 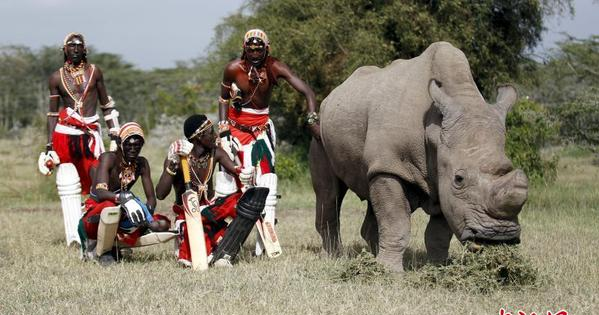 Conservationists said they have tried to get him to mate with the female rhinos. But neither of them has gotten pregnant. Animal experts are worried that the northern white rhino might become extinct. Sudan is 43 years old and may not live long. Most northern white rhinos only live between 40 and 50 years. That is why Ol Pejeta is working with Tinder to raise money for what are called Assisted Reproductive Techniques. One of these well-known techniques is in-vitro fertilization. That is where the egg of a female rhino is fertilized by the sperm of a male rhino. It becomes an embryo and then is implanted into a female's uterus. In this case, they are hoping to use the more common southern white rhino to carry the embryo and hopefully give birth to a baby rhino. When people see Sudan's profile on Tinder, they can give money to support the project. The conservancy hopes to raise $9 million for the project and to have 10 northern white rhinos in five years. Richard Vigne is the head Ol Pejeta. He says the eventual goal of the program is to introduce northern white rhinos back into the wild. The development of the food industry depends on that of agriculture. Pandas are an endangered species. The 42-year-old singer got pregnant with twins after many rounds of in-vitro fertilization. 1.In this case, they are hoping to use the more common southern white rhino to carry the embryo and hopefully give birth to a baby rhino. In this case, this worker may not need to do a formal impact analysis. 2.In this case, they are hoping to use the more common southern white rhino to carry the embryo and hopefully give birth to a baby rhino. These women will give birth to God-knows-how-many girls until they have a boy. I wanted to teach and give birth to my own set of scientific children.